Last night I had this terrible pain under my umbilicus which I can only describe as my abs tearing apart. It was awful. I decided it was muscular and that I would in fact run the Jingle Bell Run today. Well, by 3 am I was in so much pain I couldn’t even crawl out of bed to wake up Graeme who fell asleep watching a movie spiderman on netflix on the couch (he made me clarify that…). Thus, I texted Becky saying I wouldn’t be running. Througout the day it has been subsiding but SO strange. I wonder why it started in the first place. Anyways. 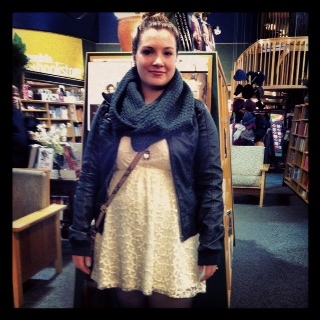 I got myself dressed in the lovely lace dress I bought last week, and Graeme and I headed off to church. After church we headed to Prairie Ink for lunch with Peter and Becky. No pictures of lunch as Becky had just run the race in the am and didn’t want her post-run self broadcasted. 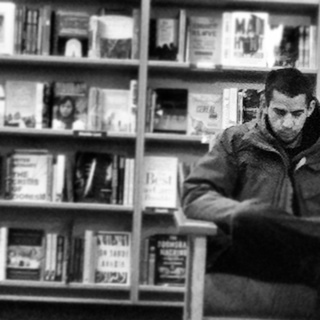 😉 There was a bit of a wait so we browed Mcnally Robinson’s…. I swear I’m not pregnant. Just have TERRIBLE posture + bad photo angle. haha. At Mcnally’s I ordered a diet pepsi, the samosa’s and a side of the tomato basil soup. All delicious. I just wish the samosa serving size was smaller, and the soup larger!! It was at most, 125ml! 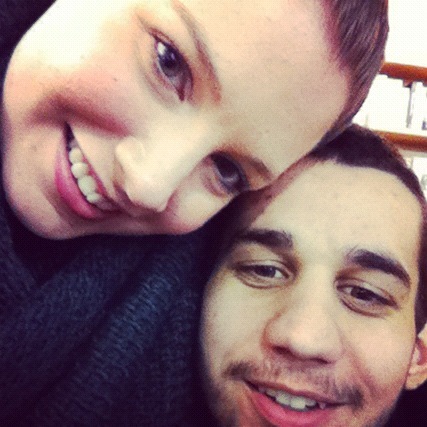 We spent the day relaxing. 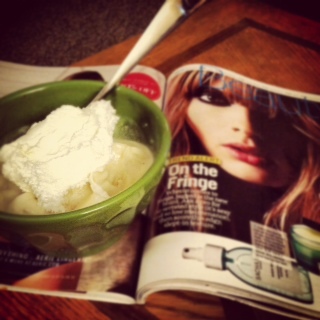 I read the new december issue of Cosmo, while eating some banana soft serve. Super easy! Freeze a banana, then pop in the food processor with about a tablespoon of milk! Top with a dollop of cool-whip and its a delicious, healthy treat! Around 6 we started making dinner: Greek night in da’ house! 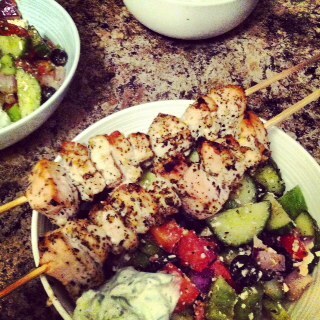 Recipes for greek chicken, greek salad, and tatziki to follow soon! Followed by the white variety of the MADD alcohol-free wines! This one was way better than the red! Smooth, fruity and subtle. 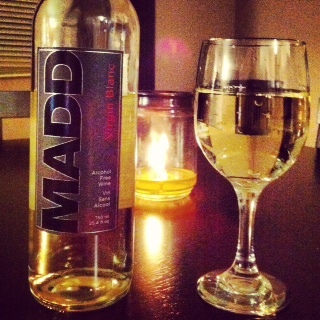 MADD’s Virgin Blanche gets a 9/10 on the fake wine scale. Delicious. I would drink a glass with dinner every night, its just THAT good! INCREDIBLY DIFFICULT. My two left feet could not keep up/learn the steps! 1/10 on the fitness video scale. I only give it a 1 rather than a 0 because I could imagine it being fun if you had dance training in the past. There wasn’t even good music to do the moves to! BOO! I wish I kept my 17 bucks! 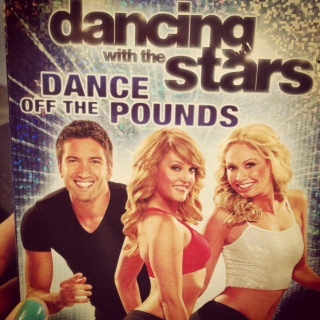 Did the Jive today…will attempt the others when my ego feels a little better! 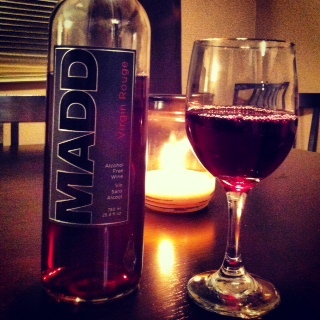 My first try of the MADD alcohol-free drink line. As someone who has never had authentic wine, I have nothing to compare this to other than grape juice. =) At the first sip Rouge had a bitter taste, but a subtle sweet after-taste. It remained complex enough that I wanted to take small sips, slowly, in between bites of dinner. At the same time, simple enough that I wanted a second glass. At only 60 calories for 200ml, nutritionally I loved it. Number of stars on the specialty drink scale: 7/10. I would drink it again if offered, but at 9.99 a bottle, I think I would prefer to try the other varieties this company offers. **NOTE** 10% of profits go to Mothers Against Drunk Driving/ Victims of drunk driving!